Learn not only the good side of a car but also the bad side using the Mississippi free license plate lookup. Enter the license plate number to get the corresponding vehicle history report. The Mississippi Department of Revenue can also be requested for vehicle information. Contact the motor vehicle support at (601)-923-7200, or you may visit the Contact Us page. You must register your vehicle within 30 days of entering the state. Submit the state’s title/license application form, along with the vehicle’s latest title and registration receipt, at any Tax Collector’s office. An ownership documentation may be required if the vehicle has a lien or is rented. Late registration will be penalized with late registration fees plus a $250 penalty. If you bought your vehicle from a dealer, you may purchase a seven working day tag from them to drive the car. In addition to the tag, two extra days are provided if the vehicle was purchased beyond the home county. The official license plate provider of the state is the Mississippi Department of Revenue. The agency provides each car with a single plate containing three letters and three numbers. A replacement license tag/decal can be requested if your existing one is lost, stolen, or damaged. There are seven (7) plate types containing more than 150 plate designs in Mississippi. To order, check out each plate’s requirements. Each tag in Mississippi is registered under an owner and a vehicle. A tag that is no longer valid can only be surrendered to a county tax collector. A transfer is not allowed. Vehicle titling in the state falls under the jurisdiction of the Department of Revenue, which governs Mississippi’s county tax collector’s offices, the entities authorized in processing title applications in the state. If a vehicle owner wishes to drive for longer periods of time, the vehicle is generally required to be titled. However, this requirement does not extend to vehicles made in 1969 or earlier. If the vehicle did not originate from Mississippi, the owner must provide its out-of-state title, the current mileage and the registration receipt. In the absence of the stated requirements, a Manufacturer’s Statement of Origin may be given if it were not titled before. Prepare your payment for the fees associated with titling. For vehicles that are leased or with liens, the DMV titling office may demand additional documents for authentication. If the applicants can fulfill the requirements, they may request a replacement for their missing or damaged titles. Once the DMV office accepts your request, the title will be delivered to you within two weeks’ time. The applicant may also pay extra fees to speed up the title’s delivery. It can reduce the delivery time to no more than three days. This choice is recommended for applicants who are in a hurry to get the titling done. If you have other questions concerning the state’s policies about vehicle titles, read the Title Frequently Asked Questions page. You may also visit the Title Forms page if you want to access vehicle title-related forms in the state. Buying a used car in Mississippi? Don’t make a costly mistake. 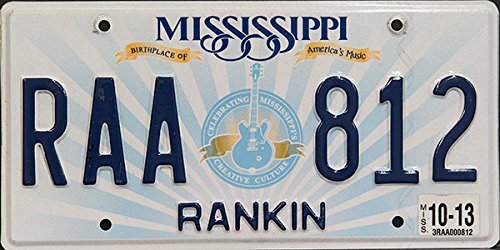 Run a Free License Plate Lookup for your Mississippi-registered vehicle! Run a Free Mississippi License Plate Lookup to uncover the full-story of your Mississippi-registered vehicle.